Rockingham County's FALL Junior Team Tennis kicks-off with a Nickelodeon WWDOP USTA PLAY DAY on September 13 for ages 6-18. Meet us on the courts at Jaycee Park 125 Jaycee Park Road, in Reidsville from 3-5pm on Sunday September 13. 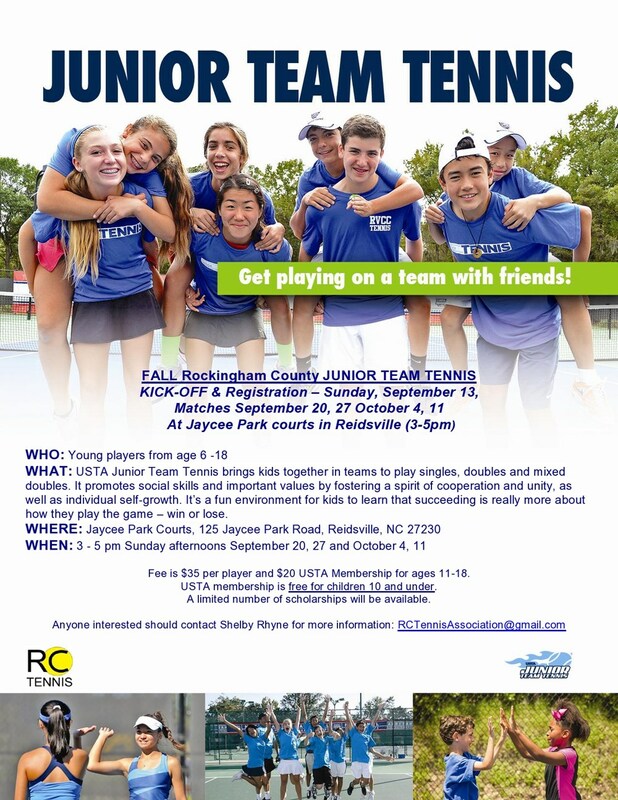 Learn more about our Fall Junior Team Tennis program whild children play fun games on the court. See flyer below for more details. The United States Tennis Association has done something amazing -- we’ve built a sports league for kids exactly the way you’d build it. It’s called Jr. Team Tennis. Jr Team Tennis grows and changes as your child grows and changes. We introduce children to tennis on smaller courts with lower nets and softer balls. As they grow, the courts and equipment change to fit their new skills. We’ve also organized our tennis league by age AND ability – so children from 6 to 18 always play kids with matching skills. Jr Team Tennis is the largest youth tennis league in America.